Fashion street was buzzing with activity that day. It was just a week before her best friend’s wedding and Anaya felt as if the whole world had RSVPed. Everywhere she went, everywhere she looked, there were hordes of shoppers, looking for fashion picks that would help them stand out. 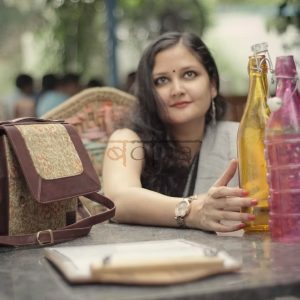 She was not sure whether it was the wedding season at blame or the fact that she barely stepped away from her desk at home – a space from where she called herself a freelance, work from home writer. Anaya was looking at the ware, spread out before her eyes. Her senses were clamouring for more, even as wave after wave of vendors hawking their products for women to pause. She stopped at the vendor with his wall of jhumkas, she stopped when she saw colourful bangles calling out to her. She answered to the call of the brocade infused waistcoats, and she paused to take in the sight of the anklets that beckoned in the stall next door. She felt like a little girl again, ready to play dress up and wow the world. As she walked, she remembered a time when she was a little less self conscious while trying on her mother’s oversized heels and a touch of lipstick that much too red for her baby face. And she laughed. Yet, it also made her sad. She had lost that charm somewhere along the way, stopping herself before picking up something outlandish to ask whether or not it would suit her and the sensibilities of the society around her, first. As she sighed and walked along, she found herself facing a mirror. Fashion looked back at her as she adjusted her trendy glasses, and straightened the collar of her kurta. Just then, she noticed him. When their eyes met, all the bling infused ware paled in comparison. He knew he had been caught, but he could not tear his gaze away. All this while, he had followed her as if in a trance, while she had stopped at one stall after another. And now, there had been contact – however miniscule. And he was not only caught in the act, he was also caught up in the moment. Slowly, she lowered her gaze as if she was willing herself to show a little more annoyance at being stared at. He decided to avert his gaze and slowly made her way past her. At this moment, she looked halfway around, and he stopped for a moment. Their paths had officially crossed and their scents seemed to mingle. He left with hers still fresh in his mind, and she was left standing there as the entire street seemed to smell of him. She gathered herself and her things, and started to walk back in the opposite direction, as if this small act of defiance would keep him from her mind. Back home, Anaya found her two best friends – Mihika, the bride, and Sumedha, the other best friend – waiting for her with their fashion exploits. It had been a divide and rule kind of morning, where Anaya had been handed the flea market part of it, while Mihika had been to the designer for her fittings and Sumedha had popped by once all the ware from the online shopping portals arrived. Now, everything had to be put together for the various looks. Ah, excitement had come a calling! 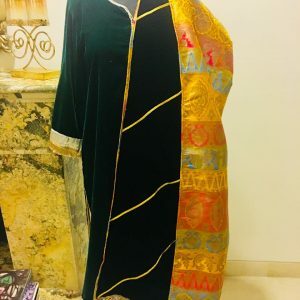 “Look at this,” Mihika squealed as she unfurled a beautiful Odhni, replete with all the royal colours that we Indians tend to wear on an almost everyday basis. The golden weave interwined with the intricate pattern on the hand crafted Banarasi number. “Oh. My. God!” Anaya and Sumedha squealed as they reached out for the colourful number. “Ooh!” Said Anaya, “I have the perfect earrings for that!” She pulled out the jhumkas from her loot and showed them. As they rummaged through the clothing, and put together various looks, they realised that dressing up had come full circle – from little girls to brides and bridesmaids. They each wondered what life would bring them, and what adventures lay in store. Yet, one of them did not know that her walk through the flea market that morning, was about to turn into something more the next evening. At the Sangeet, there was organised chaos – parents, uncles and aunts wanted to figure out and stick to the exact rituals, while the hard to catch youngsters were more interested in the DJ and the bar in the trunk of the car. Anaya adjusted her hair to cover the large jhumkas she had been made to wear – she felt overdressed because this was not her usual style. Yet, the earrings were so pretty that she wanted very much to be able to pull them off. What a conundrum she was going through internally – one that rendered her already low self esteem, completely useless! She went looking for her friends as the bride was being summoned for another ritual. As Anaya pulled Sumedha and Mihika back inside for the unveiling of the bride’s wedding Odhni, which was a ritual with much pomp and show. Just as she was about to follow her two best friends inside, the groom to be, Vikas swept past them. “Ladies,” he said with a nod and a smile, as he was ushered in by the people behind him. In the entourage that followed, she caught sight of a familiar pair of eyes. And she felt a familiar emotion tugging at her heart. He stopped. There was suddenly so much to say, yet the words refused to come out. She looked down and then, met his gaze again, trying to look confident this time. “Hi,” he said, “I am Gaurav.” His hand was extended, and despite herself, a smile emerged on her face and she put her hand in his. “Should we take a walk?” He asked. Her ears turned hot and she realised that the walk had been more than just a shopping trip. Yet, suddenly, she was not self conscious any longer. The child inside her had returned and been reunited with the woman she had become – a woman who was now basking under the glow of the praise he was offering. She was now more sure of herself, even though she was still shy as hell! Silently, she nodded, and before long, they had left the music and the chaos to find a quiet spot on the terrace. Night turned into dawn as they talked until the wee hours. With one walk, she had turned into a lady who now felt confident in her jhumkas! She confidently tucked the hair behind her ears and let the jewellery shine with her personality. A smile came to light up the night and he matched it with one of his own too. It had truly been a walk to remember, she realised as she shut her wedding album and removed her glasses, remembering how she had been sitting under her own wedding Odhni only a few months later.